Reporter Michelle Goldberg has written a terrific piece about homebirth in The Daily Beast, boldly and accurately entitled Home Birth: Increasingly Popular, But Dangerous. It is one of the first (? 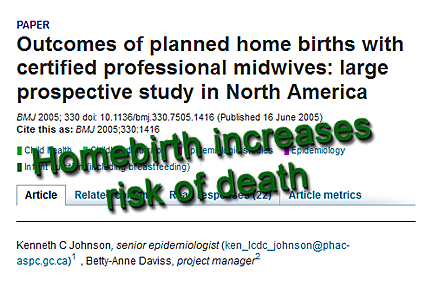 the only article) to explain how Johnson and Daviss manipulated their data in an effort to hide the fact that homebirth with a certified profession midwife (CPM) in 2000 had nearly triple the neonatal death rate of low risk hospital birth in the same year. … one of the few states that mandates the collection of data from licensed home birth midwives. In 2009, midwives performed 637 deliveries, and transferred another 160 patients to the hospital either before or during labor. Altogether, the midwives’ patients suffered 9 perinatal deaths, almost double the perinatal mortality rate for the entire state, including high-risk and premature deliveries. Three of the nine babies died during labor, which is extremely rare in hospital births. Golberg is referring to the publicly available statistics on the Colorado DORA website. The 2010 statistics (which have not yet been published, in violation of Colorado law) are far worse. It’s easy to understand why Colorado homebirth midwives hid their 2010 statistics; they are an appalling indictment of the midwives and irrefutable evidence that they are unfit and unsafe practitioners. This is the same tactic being employed on the national level by the Midwives Alliance of North America (MANA). MANA collected death rates for the years 2001-2008. While they were collecting the statistics, they publicly promised they would be used to demonstrate the safety of homebirth midwives, but once they saw the results, they decided to hide them instead. No doubt Goldberg is going to receive a firestorm of criticism from homebirth advocates. I suspect that none of them will be able to rebut the data that she presented, and that is the greatest strength of the piece.